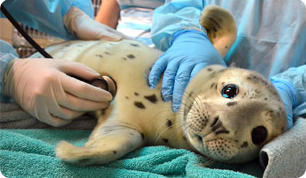 The Marine Mammal Center : Welcome Home You Little Rascal! Welcome Home You Little Rascal! It was a beautiful, sunny day - the perfect setting for four rehabilitated pinnipeds to return to the wild at Leffingwell Landing in the seaside community of Cambria, CA! Volunteers and staff from the Center's Sausalito and San Luis Obispo field offices released two Northern fur seals, Cliff Kringle and Autumn, as well as a Guadalupe fur seal named Rascal and a California sea lion named Beige on January 25. Autumn and Cliff Kringle were rescued in November and December (respectively) last year suffering from malnutrition. Autumn was also diagnosed with an acute case of domoic acid toxicity which veterinarians were able to take care of. Rascal, a Guadalupe fur sea, was rescued on Jan. 8 this year and was slightly malnourished and in a bad location, but otherwise in good body condition. "She has the unique distinction of being the 48th Guadalupe fur seal we've rescued since 1975," according to Shelbi Stoudt, stranding manager at the Center. Beige, a male sea lion patient, was also rescued in Jan. suffering from a trauma-related injury and malnutrition. Last year volunteers and staff admitted 557 marine mammals of all species.